MARLBOROUGH, Mass.—Kubotek3D today announced the V15.5 release of the Kubotek line of CAD/CAM products including KeyCreator 3D CAD software and leading CAD comparison and translation validation utilities. This release provides updates to six CAD file translators and a new internet-based login license authentication option. 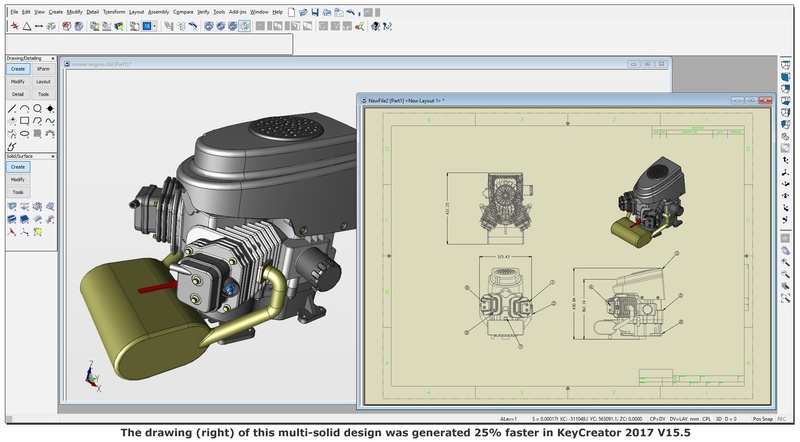 KeyCreator drafting features see view creation performance advances and dimension editing enhancements. Additionally, a new free viewer program named KeyCreator Viewer has been spun off from the Spectrum Multi-CAD Viewer product. Starting with the V15.5 release customers with stand-alone licenses on active maintenance now have the option to use a program login for license authentication. Login authentication is an alternative to the standard method of temporary activation of a license onto a specific PC through a check-in/check-out process. With login authentication the process of making the license available for another PC is simply exiting the program and can also be handled remotely from the customer’s support account on Kubotek3D.com. KeyCreator 2017 V15.5 includes three improvements aimed at improving productivity in drawings. Multi-processor support has been expanded in the Advanced Precise Hidden Line Rendering system allowing views containing large numbers of solids to draw faster. The Move function has been enhanced to allow quick repositioning of dimension extension or leader lines. Last, a new function has been added for quickly changing arrowhead type on selected ends of dimensions. The V15.5 release separates the Kubotek Spectrum product line into two products; KeyCreator Viewer and Spectrum Multi-CAD Viewer. KeyCreator Viewer is a free program that provides read-only viewing access to all KeyCreator CKD files and also CADKEY PRT files. KeyCreator Viewer replaces past products known as Spectrum Lite, Spectrum KeyCreator, and Spectrum CADKEY. Free trials of Kubotek software are available. For more information, visit kubotek3d.com.